Hungarian epic symphonic black metal band Runeshard from Budapest has just released its debut 4-track EP “Dreaming Spire“. Runeshard was founded by Bálint Kemény in early 2017 as a side-project to his power metal band Elanor. 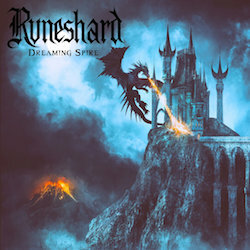 “Dreaming Spire” is available digitally for now, but in the coming months Runeshard are planning to release the EP as a digipak CD in a relatively small batch. All music on the EP is composed by Bálint, who also wrote all lyrics and performed all instruments. All vocals and narrations are handled by Alethiuz, who is also the sole member of the epic symphonic black metal project Zel Agganor from the UK, in which he also plays all instruments. According to Bálint Kemény’s own words: “Since my favourite band Bal-Sagoth is not making music anymore, my aim was to follow in their footsteps and write epic music worthy of the legacy of the barbarian metal kings themselves. Since I’m also a huge fan of fantasy video games and their soundtracks (the soundtrack of Warcraft II being my favourite), as well as movie soundtracks from the golden age of epic music (such as Quo Vadis or Conan the Barbarian) I also wanted to combine these influences with the black/power metal corpus the music is built on. Lyrically, my biggest inspirations are the sword & sorcery and horror authors of the early – middle twentieth century, such as Clark Ashton Smith and Robert E. Howard, as well as the more modern writings of Michael Moorcock“.